Nike’s marketing pitch: As soft and smooth as ever. Midsole: Lunarlon foam inside a firmer EVA foam casing. 10 mm heel-to-toe offset. Outsole: Foam with raised pods under the forefoot and heel. Widths available: D - regular. 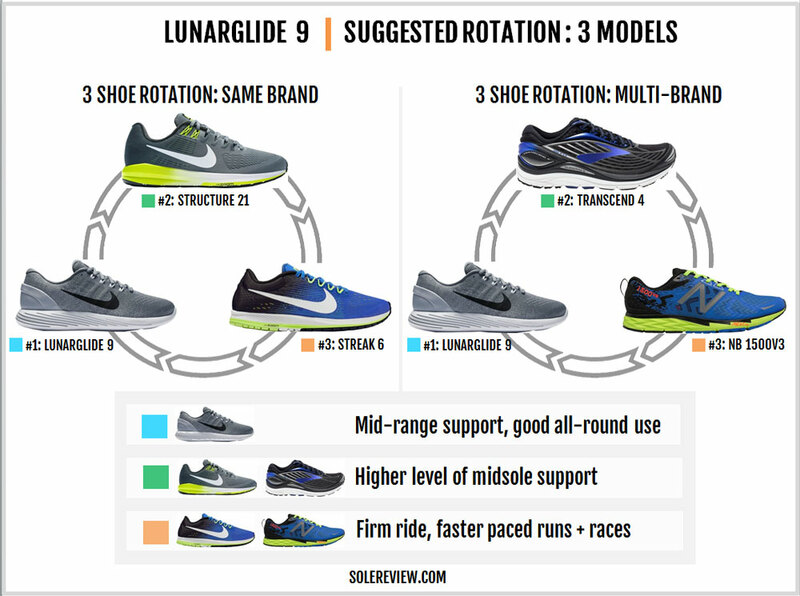 Add a couple of minor updates to the Lunarglide 8, and you have the 9. It has the same Lunarepic inspired sole design and an upper with a slightly cleaner profile. The rearfoot ride is marginally firmer than the LG8 due to the redesigned sidewall grooves. If you have been running in the older Lunarglides (6,7) so far and are now looking to replace them, here’s a heads-up. The Lunarglide as we knew it got an extensive make-over last year. 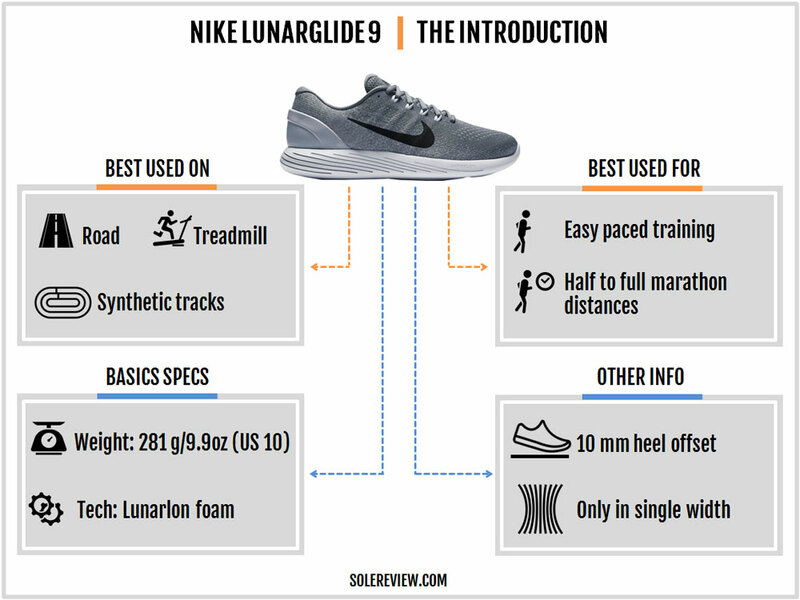 Everything about the Lunarglide 8 was new. 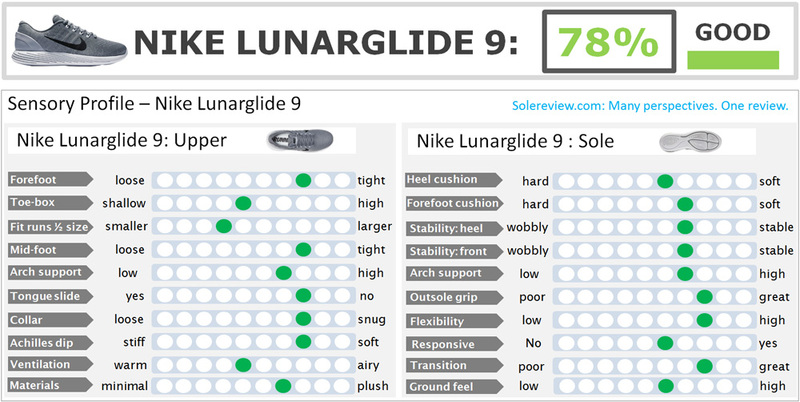 The midsole contained Lunarlon, but switching to a Lunarepic inspired sole design altered the ride quality. 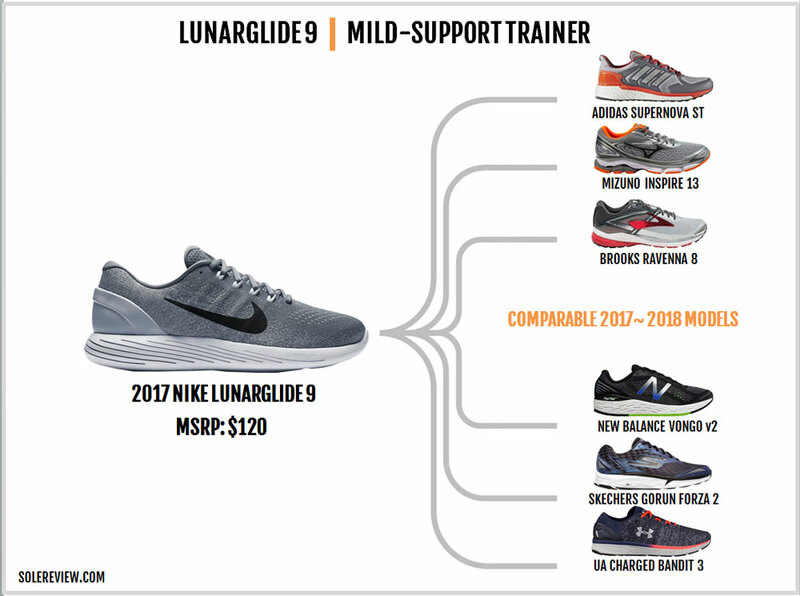 This year brings a minor update to the Lunarglide 8’s ride quality, while the upper fit is more or less the same. 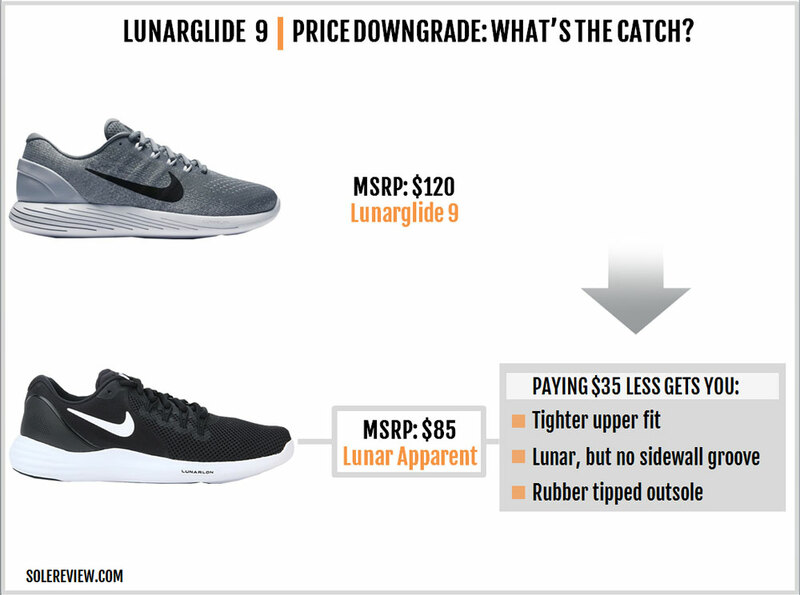 So you know the drill – if you already have the Lunarglide 8, get another pair of the same instead of buying the LG9. And in case the LG8 didn’t make the cut for you last year, scroll down to the bottom for a list of alternatives in the mild-support category. 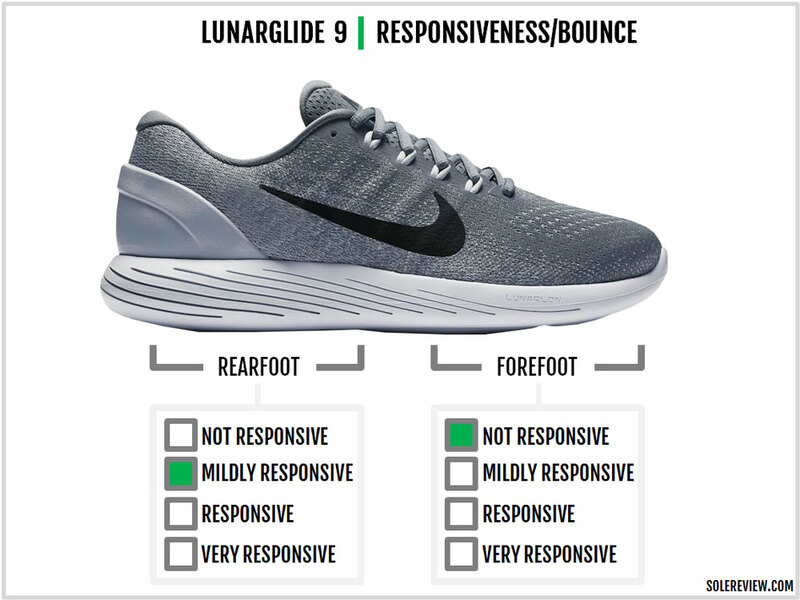 The Lunarglide 9’s upper has an identical form factor as the 8, only visually cleaner. 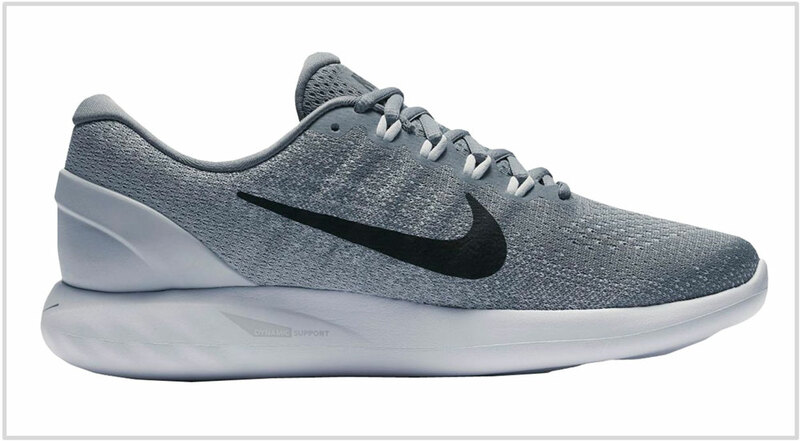 There’s a single-piece knit Flymesh upper on the outside with an internal sleeve which wraps around the midfoot. An internal bumper creates dedicated toe-box room in the front. The Flywire cords have been redesigned for the LG9. Instead of the thin cords on the 8, the Lunarglide 9 uses thicker cords which are concealed between the outer upper and the inner sleeve. You can see these as slight bumps under the printed Nike Swoosh logos on the side. The thicker cords feel like another set of laces placed over the midfoot sides. There’s also one less column of Flywire on the 9. The last couple of eyelets are no longer attached to this cinching system. While the round laces are the same as last year, the lacing panel isn’t. Instead of the transparent laminate seen on the 8, the eye-stay uses a no-sew synthetic which adds a bit of extra strength in that area. This was probably done to accommodate the thicker Flywire cords which produce greater friction on the eyelets. The heel counter receives a couple of minor updates. There’s an external heel covering which looks like plastic at first glance but isn’t. The heel heel counter is made of a flexible material which feels like part foam and part rubber. The heel area looks a bit downmarket when compared to the LG8 or molded plastic. On the bright side, the rubberized clip doesn’t exert side pressure like some of the past Lunarglides did. This component also houses a tiny reflective trim in the same location as the LG8. The second change happens to be the heel collar height. The LG9’s upper rises slightly higher on the sides than 8, an update which has a minor effect on the fit quality. As far as the levels of foam padding go, the LG8 and 9 are equally matched. The collar and tongue are generously quilted with foam for comfort, grip, and insulation from the top-down lacing pressure. 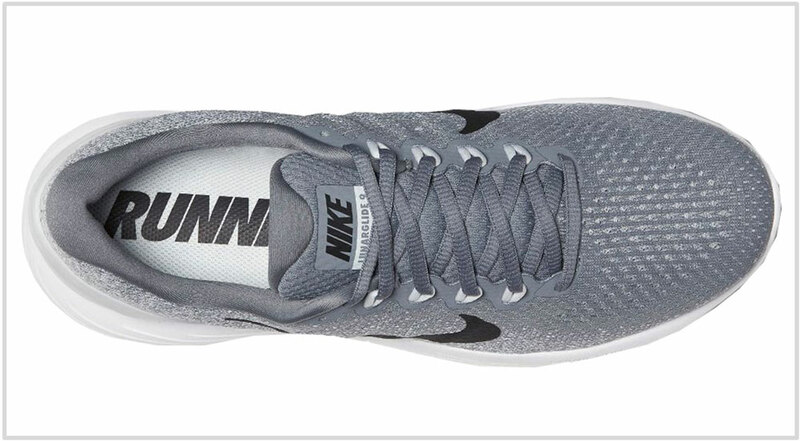 There’s another factor which makes the Lunarglide 9’s upper design appear subdued. The LG8 used a two-tone Flymesh which added visual depth to the otherwise minimal upper. The Lunarglide 9 doesn’t have that texture, so the overall design looks a bit bland. 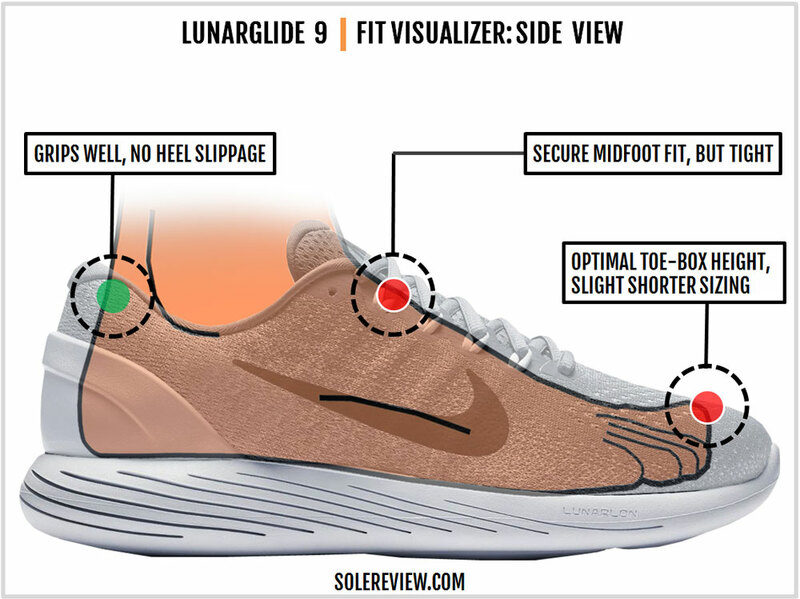 The Lunarglide 8 and 9’s sole design is based on the Lunarepic. A softer Lunarlon core is encased within a firmer midsole, and the sidewalls have thin grooves cut in. The LG9 follows the same design, except that there’s a change in the sidewall groove design. Instead of being limited to the rearfoot (on the LG8), the Lunarglide 9’s side grooves extend all the way to the front. 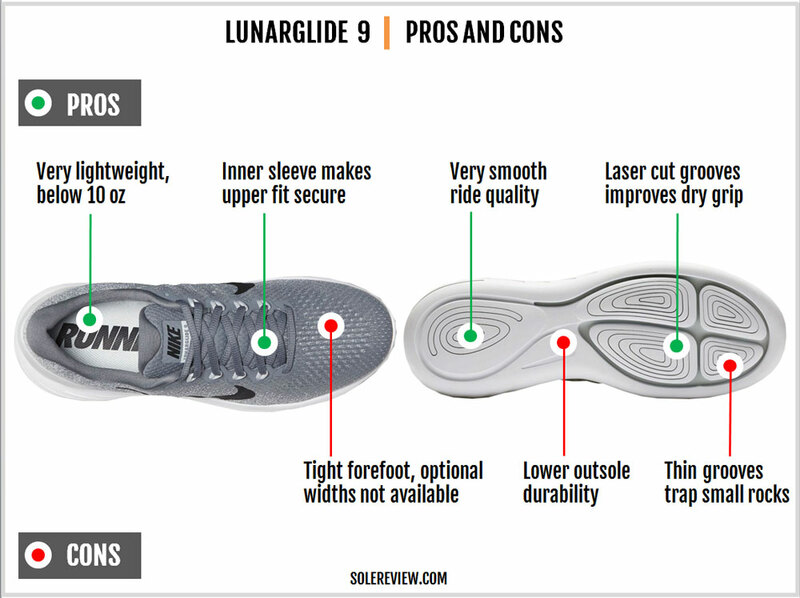 This changes the Lunarglide 9’s ride quality, both from a cushioning and transition perspective. 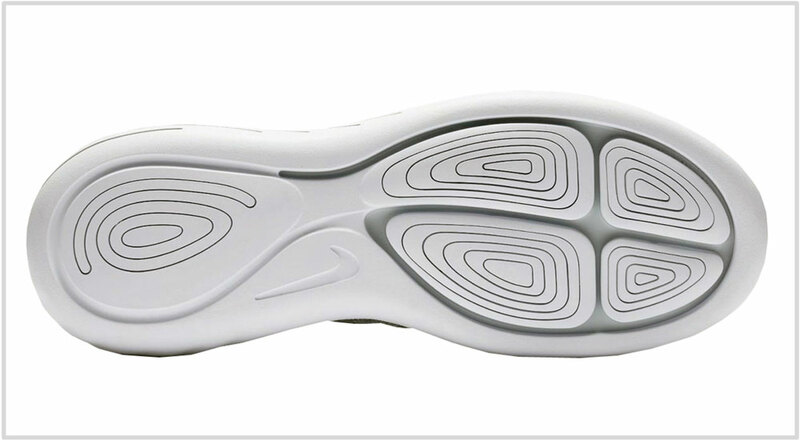 The outsole is mostly the same, except that one of the midsole grooves extends downwards to the outer heel edge. Otherwise, the layout is identical to the LG8. This is a rubber-free layout with forefoot and heel pods. And much like the Lunarepic and the LG8, the grooves within the pods trap small rocks and dead bugs. The grooved pods grip well, but only when it’s dry. Inside the upper is the same removable insole made of blown foam. Expect around 300 miles of running life. The first parts to fail are the usual suspects – that’s the Lunarlon core and the all-foam outsole. The Lunarlon core will gradually lose its cushioning, and the lack of rubber on the outsole will lead to the latter’s early demise. To be more specific, you’ll see wear and tear around the grooves of the forefoot and heel pods. 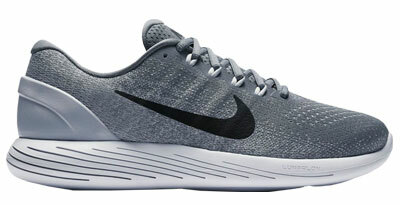 Not much has changed on the upper since the Lunarglide 8, so the fit quality is nearly identical to the outgoing model. The only noticeable change is felt around the midfoot. Using thicker Flywire cords makes the midfoot fit more snug-fitting. Does the midfoot feel better than the LG8? Yes. The thicker and softer cords on the 9 do a better job of spreading the cinching pressure. The insides feel smooth because of the inner sleeve and the seamless construction. The plush padding of the tongue and heel add comfort and grip. Also, the heel collar is higher (than the LG8) on the sides, so the upper feels more secure too. The Lunarglide has always been a shoe with great heel grip, and the 2017 model is no exception. Note that the external heel counter is rubber-like, so it doesn’t press into the sides like how the LG6 did. 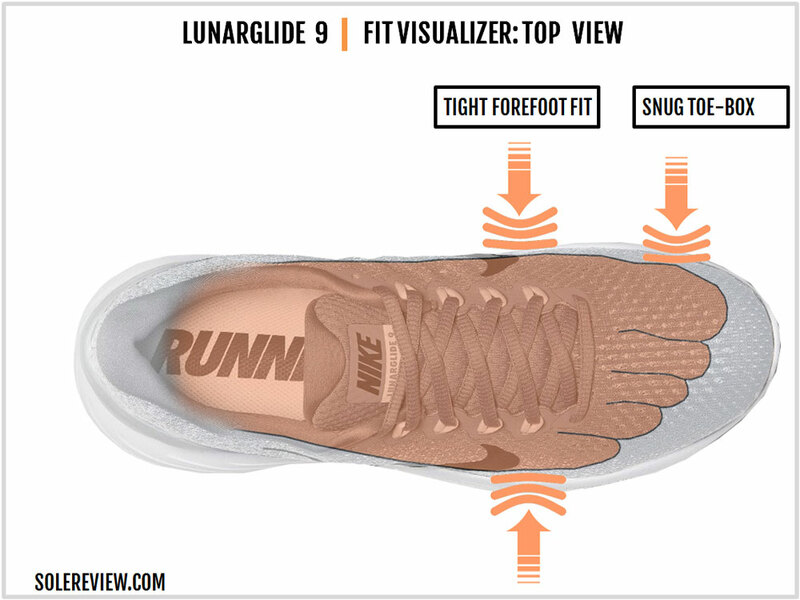 The Lunarglide runs a bit warm due to the inner sleeve construction. Good for winters, but that’s something to watch out for in warmer seasons. 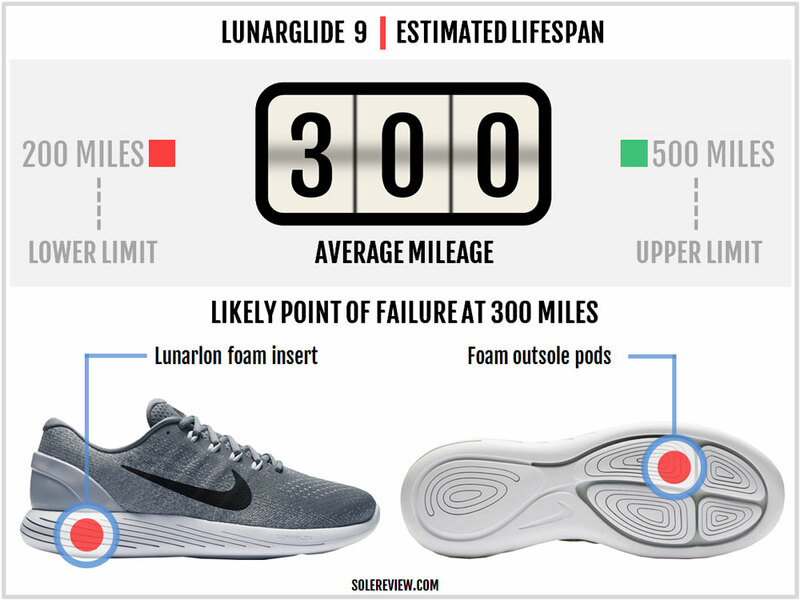 Calling the Lunarglide a ‘stability’ shoe is a bit of a stretch. It has a cushioned and a supportive ride with a hint of lateral bias, but then that’s true for most running shoes, even neutral ones. The Lunarglide 8 had a smooth ride, and the version 9 makes it slightly better in the forefoot. Introducing flex grooves on lateral forefoot allows the midsole to compress on the outer side – a trait which was missing on the 8. 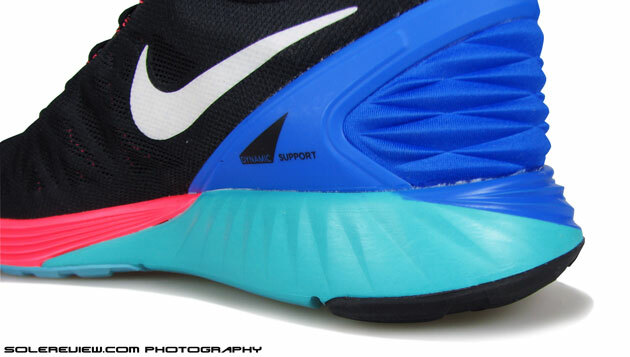 On the last year’s Lunarglide, all the forefoot softness was focused in the center due to the Lunarlon embed. With the new midsole design, you get this sense that some softness spills over to the outer forefoot. As a bonus, the forefoot transitions feel smoother too. That said, the rearfoot ride is a bit firmer than last year. This sounds counter-intuitive considering that there are more grooves, but it has to do with how they are designed. The LG8’s rearfoot grooves were directly stacked together. When weight was applied, the five grooves compressed all at once to deliver cushioning softness. On the LG9, the grooves are spaced out. So the effective count of grooves under the heel is actually three and a half instead of five. So fewer grooves = reduced compression = marginal increase in rearfoot firmness. Also, the midsole compression (on the outer side) feels better distributed instead of being concentrated in the rear like the LG8. Responsiveness – the midsole’s ability to rebound – is average on the Lunarglide. The forefoot delivers better feedback due to the foam pods which have a piston-like effect. But in relative comparison to new-age materials such as the Boost and Everun, the Glide feels flat. On the bright side, the LG9 doesn’t feel slow. The transitions feel smooth and efficient, as the midsole allows the weight loading to happen with very little mushiness. On synthetic tracks, the forefoot outsole grips very well and that helps with quick push-offs. When used for half-marathons and longer, the Lunarglide’s padded ride kicks in. There’s enough foam between your foot and the road to keep the runs comfortable for most distances. All said and done, the midsole insert is Lunarlon. This foam tends to degrade over time, so the ride experience at mile zero will not be the same at mile 200. The most irritating thing about the Lunarglide or the Lunarepic is their outsole. The foam pods with their thin, concentric grooves pick up small debris from the road, and it’s a pain to pry them out after a run. And you can’t ignore them – you distinctly sense these objects lodged inside. This is just bad design. Sure, for the first year, we’ll cut Nike some slack. But not changing it after even two years? That’s plain apathy. The outsole grips great and whatnot, but that’s no good if you’re always busy removing rocks from your outsole. The upper still doesn’t offer additional widths, so that’s another point docked off the score. Among the things we like, count the smooth transition quality, the cushioned and supportive ride, and the secure upper fit. And thanks to the foam outsole, the Lunarglide manages to keep the weight below 10-ounces. While the LG9 lacks the distinct ‘Lunarglide-ness’ of the versions 6 and 7, it still combines the cushioning and mild-support aspect well. The softer core keeps the weight centered, and the side grooves provide a wee bit of bias. The upper has a snug yet comfortable feel. Transfers feel smooth due to the uniform stacking of the dual-density foam, and the outsole pods deliver good feedback. The Lunarglide 9 is a competent daily trainer, as well as a long-distance running shoe. That said, you should be willing to remove the rocks out of the sole after each run. There are only minor changes over the LG8. The ride is slightly firmer in the rear due to the redesigned sidewall grooves, and the forefoot transitions feel a bit smoother. The midfoot fit is a little more secure due to the thicker Flywire cords. The lines are getting increasingly blurry between the neutral and support footwear categories. ‘Support’ or ‘stability’ shoes – the kind with medial posts and similar motion-control features – are gradually fading away. Even within Nike, older models like the Lunareclipse or the Zoom Odyssey have been retired. That leaves just the Lunarglide and the Structure as official ‘support’ shoes. Nike also displays the Lunarepic when you filter ‘support’ on its website. While the Lunarepic and the Glide share similar midsole aesthetics, the Epic is too soft to be in the same category as the Lunarglide. So if you wanted a cheaper yet supportive running shoe, then you could get the Lunar Apparent. The Apparent has a Lunarlon embedded midsole with a supportive ride. The upper fits narrower than the Lunarglide. This year, the lightweight Lunar twins – the Tempo and the Racer – are no longer available. So what do you do for a lightweight racer/trainer, then? For now, the best recourse is the Zoom Streak 6. And if desire a higher level of medial-side support, then the Zoom Structure 21 is the shoe for the job. The New Balance 1500V3 complements the Lunarglide with its lightweight and supportive ride quality. Use the 1500V3 for quick track runs and races, and the Brooks Transcend 4 for longer runs in greater comfort and support. Here’s a quick round-up of the different mild-support models. Compared to a few years ago, there are now many running shoes available without a super-obvious medial post. For example, the Underarmour Charged Bandit 3 mixes cushioning and support just like the Lunarglide does. In fact, the Bandit is the closest you can get to the feel of the older Lunarglides (6, 7). Then there’s the new Supernova ST and the New Balance Vongo 2 with their near-neutral ride manners. The Mizuno Inspire 13 is inherently stable due to its large Wave plate. Brooks has made the Ravenna 8’s stability aspect milder than the older models. The Skechers GoRun Forza is another mild-support shoe without an invasive stability feature.